A moulded 3.5mm mono jack plug that terminates with two colour coded 2mm plug. Connects your E-Stim electrodes such as the E-Stim lightweight range or E-Stim self adhesive electro pads to your E-Stim power boxes or Folsom, PES and ErosTek control units. Available with a standard 1.5M cable lenth or a 4M cable length for those requiring a further reach. Comes with an E-Stim 3 month guarantee. 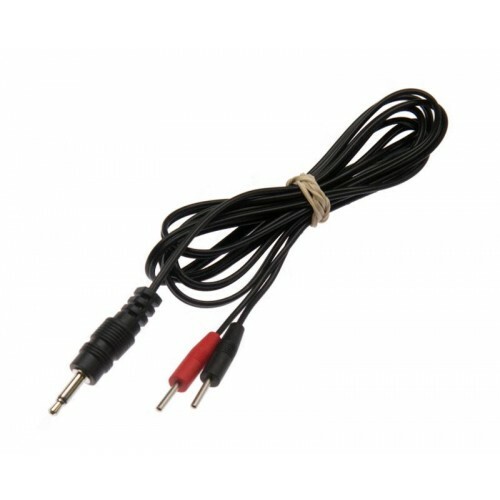 Metric 3.5mm mono jack plug with two 2mm plugs x 1.5M (standard) or 4M (long) cable.